Gingham is pretty much my go-to print for summer. Something about this picnic tablecloth print just makes me feel instantly more refreshed in the current July heat. 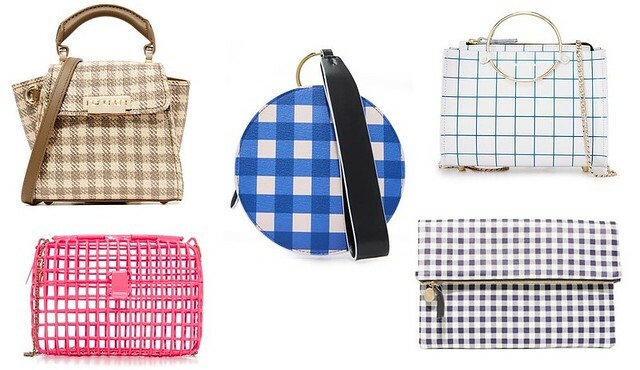 Here's a peek of some of my gingham-printed favorites currently available at Shopbop. Links below are not affiliate - have a lovely weekend! Bags by: ZAC Zac Posen / Anndra Neen / DVF (under $200) / Future Glory Co. / Clare V.
Your post on gingham got me to thinking about a J Crew skirt that you have, the pixelated houndstooth skirt in the pretty reddish lavendar color. I let it slip through my fingers but I have found it somewhere in a size 6. I run between a 4 and 6 at J Crew. Did you find this skirt true to size? Thanks. Hi Rachel - I did find the skirt TTS but it has absolutely no stretch. I adore the print but the thicker material and front pleat makes the style a bit unforgiving - if it's a bit tight, it doesn't look right. If you don't mind it fitting a bit large in the waist, I'd recommend going with your larger size. I think the skirt will "fall" better when it is slightly larger rather than smaller. HTH!